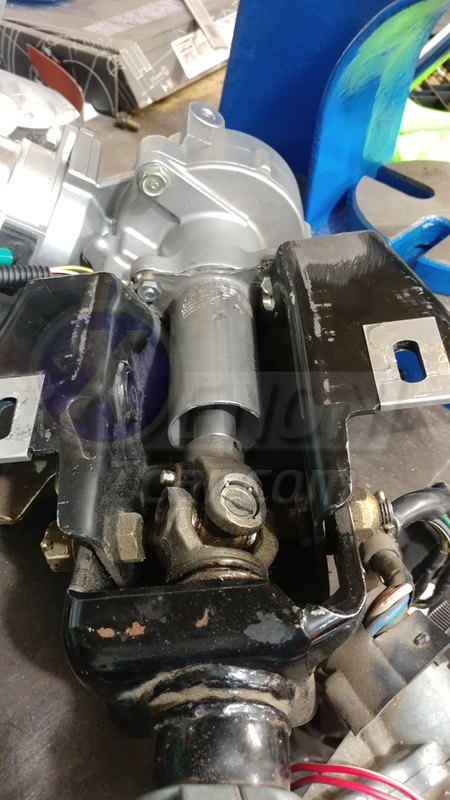 The torque sensor housing can be clocked in two orientations, I suggest rotating it 180 degrees from the stock position to provide yourself with a more compact unit. Make sure not to damage the components within, as these toothed gears are how the torque sensor does its thing. 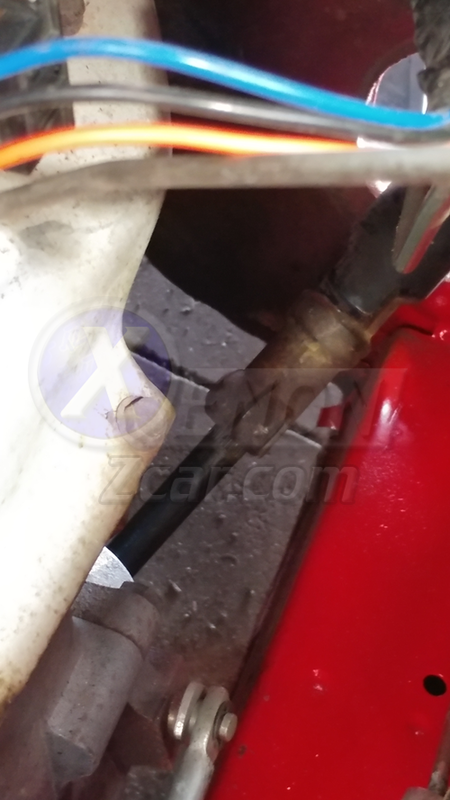 Remove the stock steering column. There are four 12mm bolts that hold up the column, and three phillips/10mm bolts that hold the column tube/plate to the firewall. 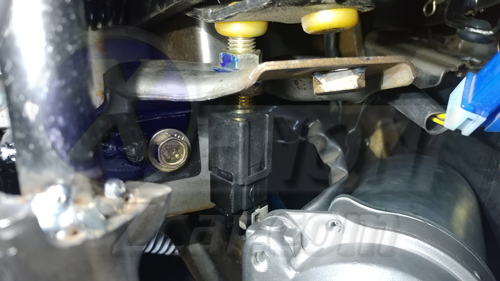 Disconnect the universal joint from the steering rack, and pull this assembly from the car. Disassemble the rear half of it, but keep all of the parts for now. I started by cutting down the main bracket, to 95mm. 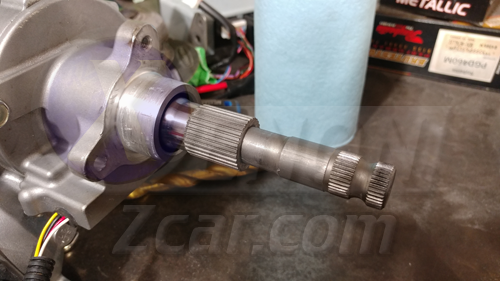 Take the front piece of the stock intermediate shaft (That attaches to the universal joint behind the steering wheel) and cut it down to 76mm or so. You could cut it shorter, but I left mine this long when I was test fitting the components as it allowed plenty of room for adjustment. 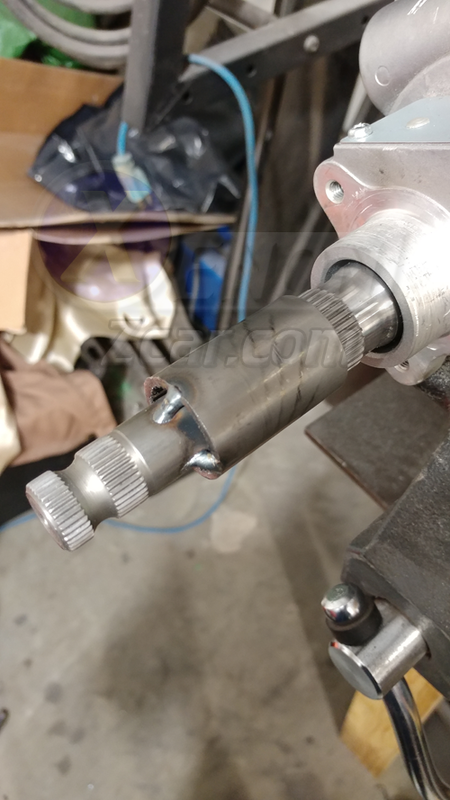 I cut the input shaft of the assist motor down to 35mm from the flange to the tip, you could leave it a bit longer but it's not really necessary. 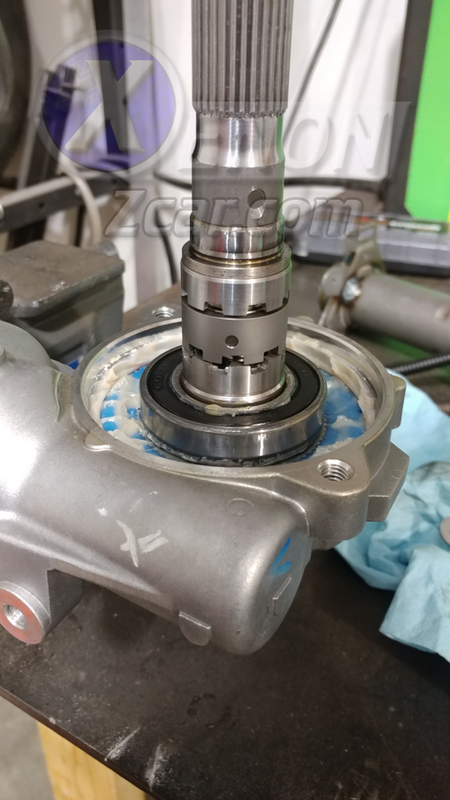 I recommend taping off the gap between the input shaft and the torque housing, as the needle bearing at the front is not shielded. 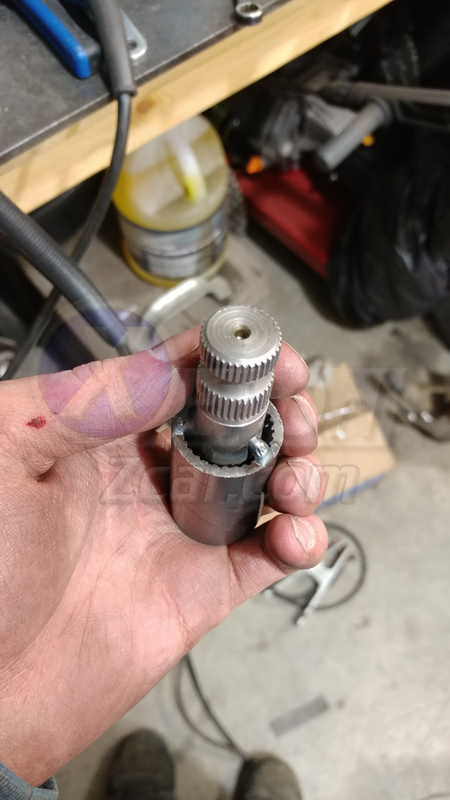 I cleaned up the input shaft on the motor, and the section of stock intermediate shaft, and as it turns out, the two fit together nearly perfectly. 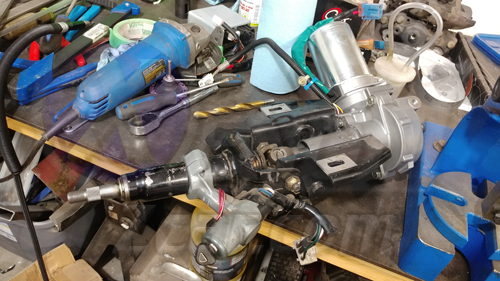 A complete fluke, but it made the process of fitting the motor up a lot easier when I was making adjustments, as well as keeping it in line with the front universal joint. I recommend leaving the stub long for now due to this. Cut down the motor tube (attaches to the input side with three 10mm bolts) so it ends shortly before the universal joint. It doesn't pose much importance in our application, but the farther out we support it, the better. Loosely assemble the modified column and determine the angle you want the motor at, and check for clearance between the motor and the clutch pedal assembly (if you choose to mount it upwards) If you use the same measurements as posted, it should all fit (you may need to slide the column towards the driver on the front mounts). 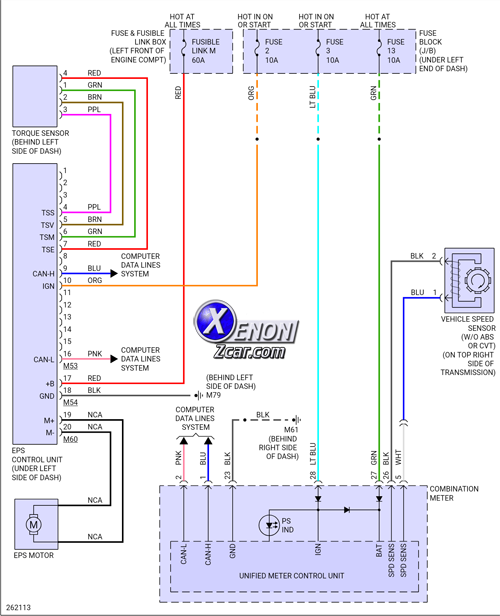 The clutch pedal return spring will come close to the motor, but it should (barely) clear. 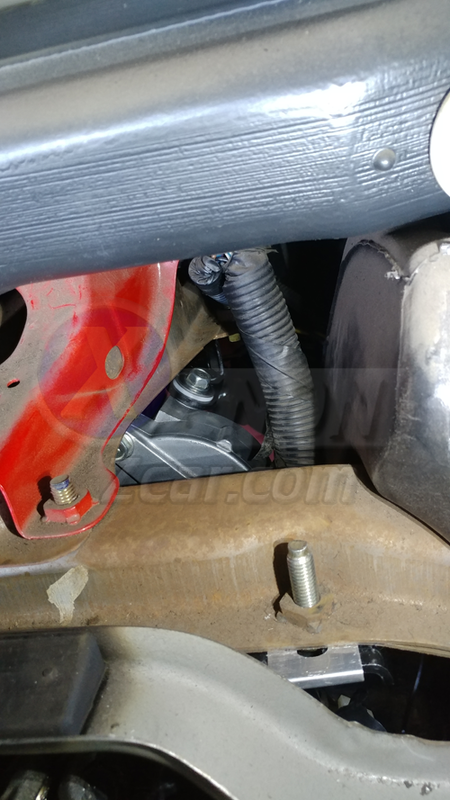 My motor ended up at approximately a 40 degree angle to the flat side of the column mount. Your brake switches may not clear with the motor mounted upwards, I was able to mount the one upward one, but not the lower one. This was not a huge concern for me with no cruise control and a manual transmission, but alternative measures may need to be taken if the motor is mounted up. 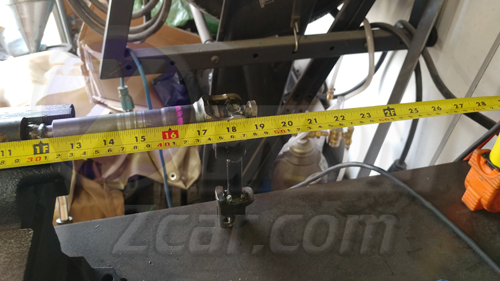 With the stub we prepared earlier inserted into the motor input shaft and universal joint (to aid alignment of the motor to the universal joint), I tacked the motor tube to the column bracket, and did another test fit to make sure everything still fit. Make sure to weld the tube to the column bracket as straight as you can. After making sure it fit, I welded the tube to the column bracket. 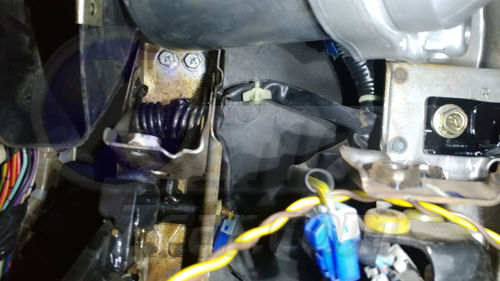 It was at this point I realized it would be very difficult to bolt the motor to the new column, so I clearanced to allow the top two bolts to be inserted. 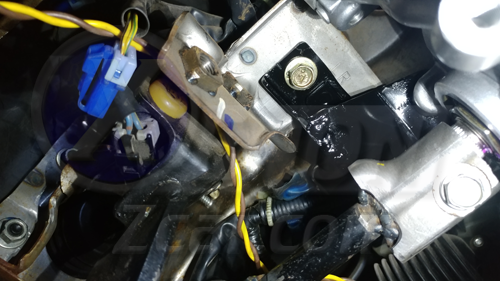 I drilled the threads out of the top two mounting holes on the motor which allowed me to use nuts and bolts from the other side of the bracket. 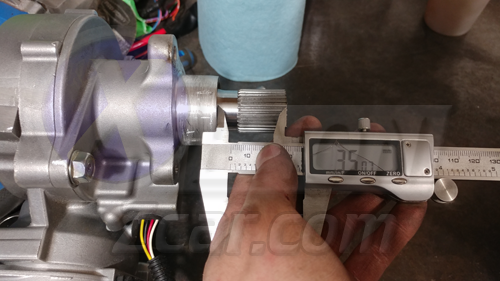 At this point, you should be able to bolt the motor to the column and manipulate it as you need. 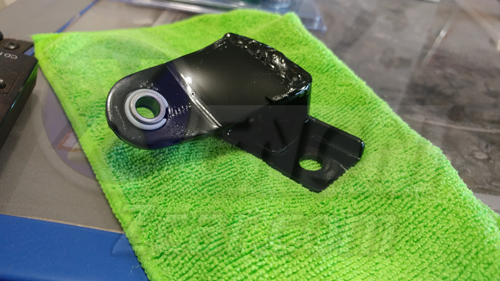 With the motor now affixed to the bracket, you have two options to connect it to the front universal joint: you can weld the stub to the input shaft, or you can make an adapter coupler. To reduce the amount of heat I induced to the motor, I opted to build an adapter. 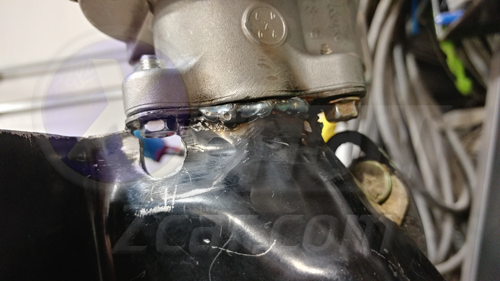 If you do choose to weld to the motor directly, make sure to pace the heat as the internals are plastic. 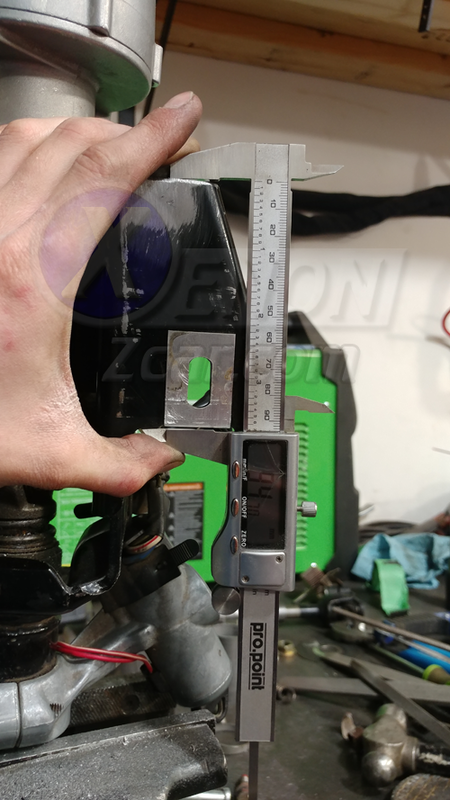 I cut down the front shaft from the Versa column to approximately the same length as below the step on the shaft of the stub I cut, It probably could be cut shorter but the more spline engagement the better. 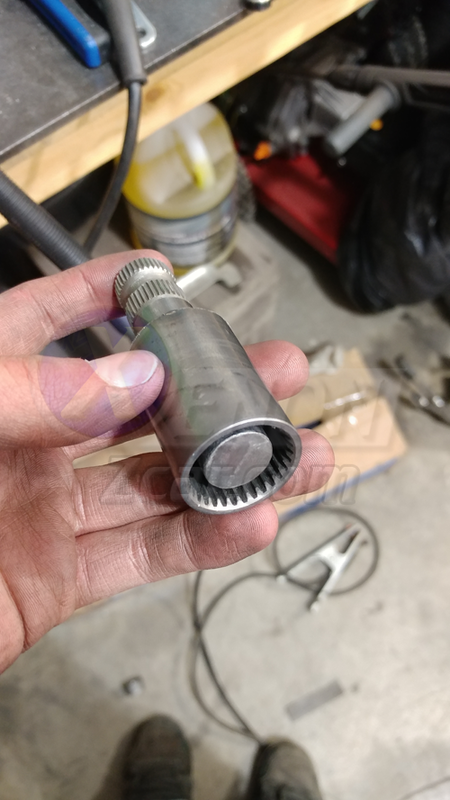 I inserted the stub into the motor shaft until it bottomed out, and then I bottomed out the spline sleeve as well before tacking them together. The stub could be cut much shorter before this, but I wanted as much support as I could get. Using the motor as a jig meant I wouldn't have to worry about the alignment of this part later. I fully welded the part off the motor just in case. 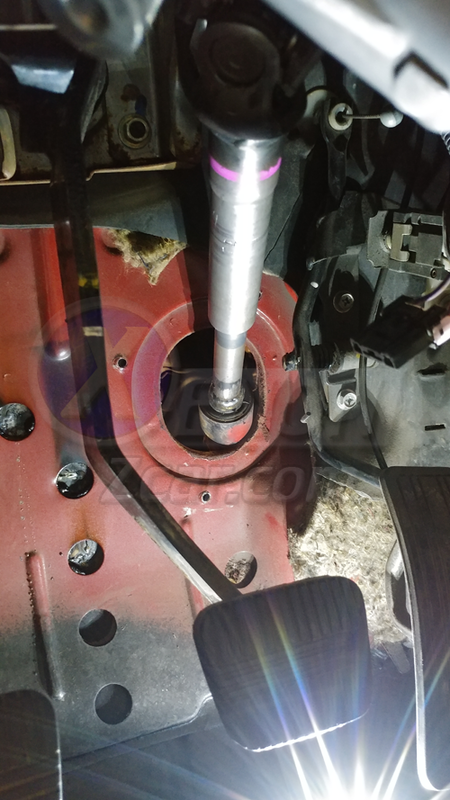 Test the consistency of rotation of the input shaft on the column to ensure you have no binding issues. With the bulk of the steering column assembled, I braced the motor tube for added support, I used a conduit clamp, but anything should do here so long as you give it some support and added strength, the motor is quite heavy. You can assemble the motor and column likely for the last time here. With the column bracket shortened as much as it is, make sure to drill a new hole for the lever return spring for the tilt mechanism. For the new intermediate shaft, take the stock Versa shaft and the stock Z31 shaft and merge them into one. I suggest cutting off the end of the Versa shaft that has the universal joint with the splines on it, you will see why in a moment. The Versa has a collapsible shaft, so I would suggest taking advantage of that if you can, I may revisit my shaft later to take better advantage of this. 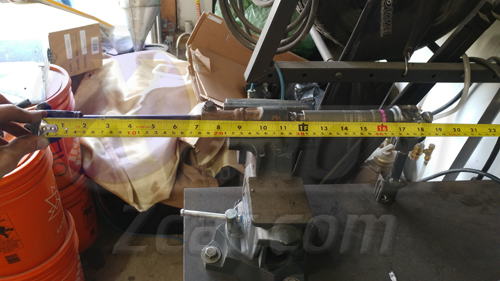 Due to it being collapsible, the distance between the universal joints on this shaft will be able to change, but at a minimum it should be 18 1/4" long from center to center. 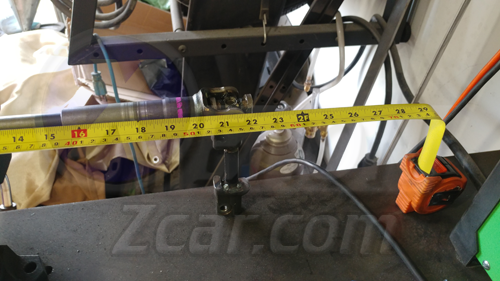 My shaft is 21 3/8" center to center extended, but this is much, much longer than necessary. I joined the two shafts at the rubber union on the Z31 shaft, but you may be able to omit this. 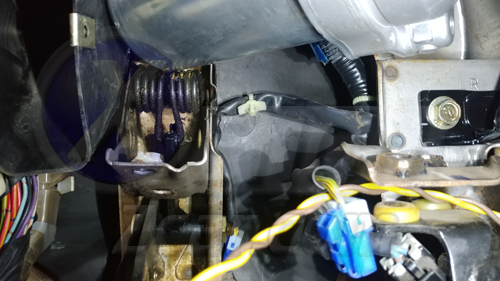 Remember that you have the ability to make slight adjustments at the spline section in the engine compartment as well, so you don't have to be perfect here. We ended up between 19" and 20" total. Now this is an important part. 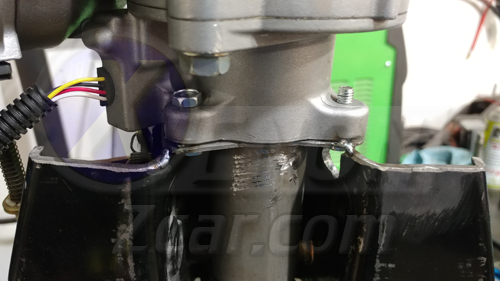 If you cut off the universal joint that has the splines for the motor, you will now see why. 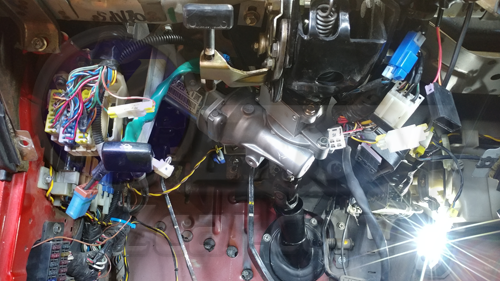 The new modified steering column is a couple inches shorter than the stock one, and as such the steering shaft would be at too low of an angle if it were directly attached to the motor. 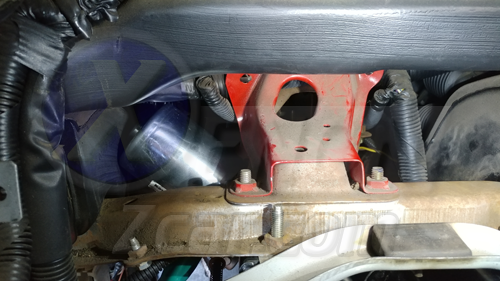 To remedy this, I took a section of the Z31 column I saved from earlier and ground down the ends so it fit into the universal joint ends. 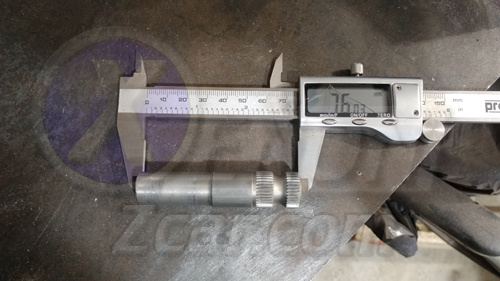 The distance between the center of the universal joint to the center of the clamping bolt hole is 5 7/16". 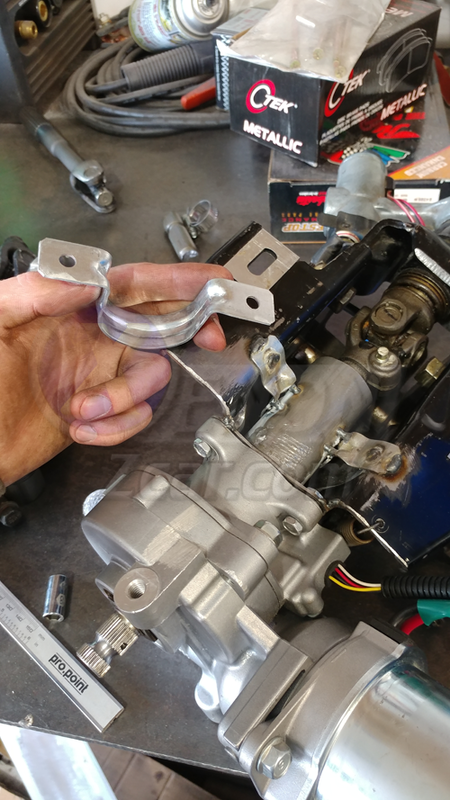 Tack the parts together as straight as you can and test fit them to ensure the steering shaft passes through the firewall opening more centrally. I would recommend test fitting the pass through plate as well. Adjust as needed, and weld together. 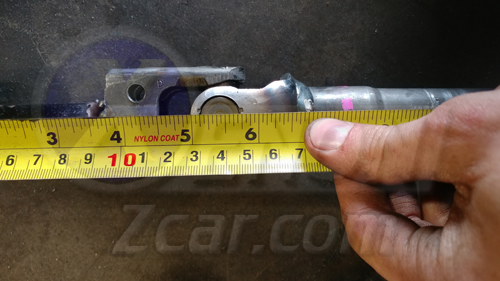 If you didn't cut off the splined universal joint (like me), then you will need to get another steering shaft to get that splined section to fit the motor (A Saturn Vue has the same motor output shaft size). Save yourself the trouble and use the other end. 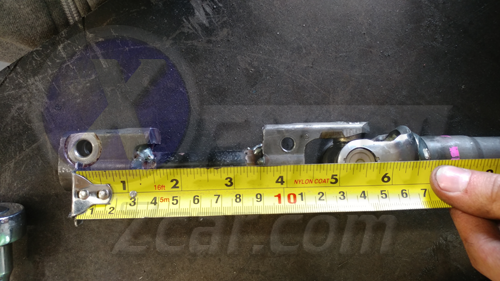 Your bracket may differ depending on how you mount the motor, and how you make sour bracket. I installed this bracket, and that was the last piece of the mechanical puzzle. And with that, the mechanical portion is done. Mount the control computer as you see fit. 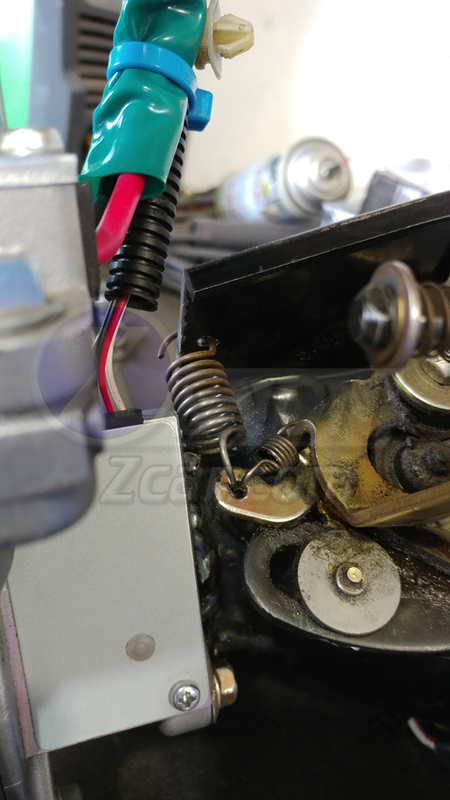 Provide a good ground on the large black wire, battery power through a 60A fuse on the large red wire, and a switched ignition signal on the orange wire. The blue and pink wires can be ignored as they are only used for CANBUS communication, and we don't have that. And there you have it! 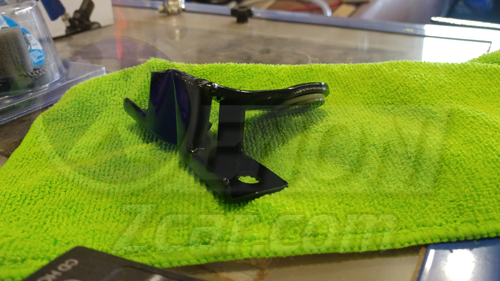 This modification should be completable within a weekend if the parts and tools are handy.